One hundred and ten people attended the Sept 4, 2018 Spearfish Area Historical Society's first program of the 2018-19 season with Dr. David Wolff presenting "Industrializing the Black Hills -- Mines, Railroads, and People". 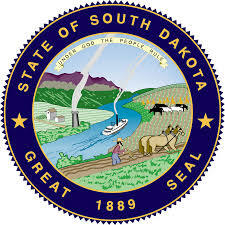 Did you know that the SD state seal/logo was design in 1885 and approved in 1889? It features a smokestack of a smelter, but there was no smelter industry in the state at the time. Where was the payout gold found in the Black Hills? Along Deadwood Creek and Whitewood Creek. Was there any violence in the early years of the Black Hills Gold Rush? Sadly, yes. There were instances of claim jumping and stage hold-ups. Who got the winning stake? The Homestake deposit was discovered by Fred and Moses Manuel, Alex Engh and Hank Harney in April 1876, during the Black Hills gold rush. A trio of mining entrepreneurs, George Hearst, Lloyd Tevis, and James Ben Ali Haggin, bought the claim from them for $70,000 on October 18, 1877. The Homestake deposit was a 600' x 1500' claim. An 80-stamp mill began crushing Homestake ore in July 1878. The partners sold shares in the Homestake Mining Company and listed it on the New York Stock Exchange in 1879. What happened to the Homestake Mine? George Hearst died in 1891, 14 years after stepping onto the Homestake depost. Thomas Grier took over as manager and, together with Charles W Merrill, set up cyanide processing plants to retrieve the gold at 90% recovery -- the slime plants. Many more claims were added, for a total of 300 claims by 1900. The mining company grew from a handful of employees to 2,000, employing mostly immigrants hailing from all over Europe, although over half were Cornish or English. From 1890 to 1910, the Lead area had the most diverse population in South Dakota. 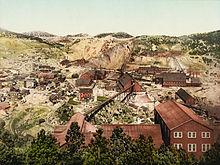 The Homestake Mine was in production for 124 years until the end of 2001. In 2002, the Homestake Mining Company was merged into the Canadian-based Barrick Gold Corporation. Local offices and employees continue to control and monitor land management and environmental aspects from the massive mine.